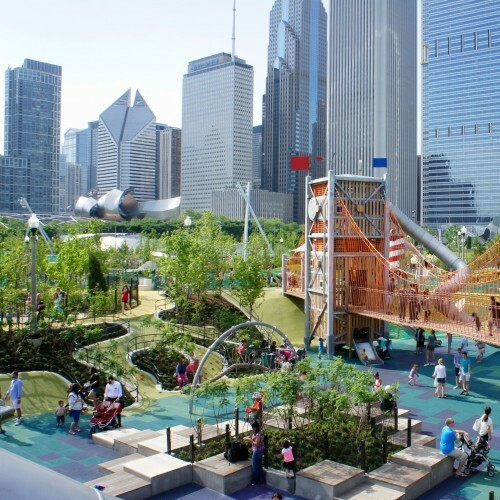 Chicago’s new Maggie Daley Park is located right downtown on the lakefront. I got an email from an old friend in Florida, Bob Ducanis, asking me to write a column explaining what is going on in my Chicago. I immediately heard the refrain, “My kind of town, Chicago is my kind of town,” the old song. And then I paused to ask myself, is it still my kind of town? Is it a place I am happy to call my home? Do I want my kids and grandchildren, to call it home for a lifetime like I have? These are my feelings for Chicago, 2016. It changes slightly with the headlines, but only a few degrees. First, let’s get the pronunciation right. My town is Chicawgo. If you don’t get the middle syllable right, move to Gary and never schlep into the city for pizza. Like other big rust belt cities, it is a huge living contradiction. It is losing population faster than any other big metropolis, but upscale condominiums sell quickly. No overbids like San Francisco and Los Angeles, but firm pricing near Lake Michigan and the neighborhoods young people want to live in. Both of my sons bought homes in the city in the last five years and their property has gone up in value. Racially, the city is segregated by neighborhoods, though not as much as it used to be. The south and west sides of Chicago are war zones. Black youth unemployment is 50%. The schools are dangerous places. 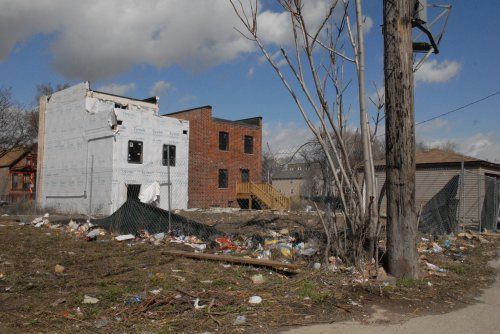 Drug wars menace everybody in neighborhoods like Englewood where my father and Derrick Rose grew up 80 years apart. Our business used to do its banking in Englewood at 63rd and Halsted. Today it is an empty lot. If you are poor and black and live in Englewood or other neighborhoods like it, you live in the American version of Syria. Refugees are leaving for relative safety in places like Atlanta. They can leave without a passport, and they are. Frankly if I were Black growing up in Englewood I would leave, like my great grandparents left Russia and its violence. We have no KKK in Chicago, no lynchings, but random slayings every day and night for innocents unlucky enough to be in the wrong place at the wrong time. Englewood in Chicago, where Derrick Rose and Leonard Graff grew up. When gun violence is so rampant it affects people who live in relatively safe areas. I live in a comfortable integrated suburb of Chicago, 28 miles south of the Loop. The local Starbucks and Panera usually have half black and half white customers. This is an anomaly in Chicago. Yet the parents of black male teenagers in my suburb are truly fearful of their kids being stopped by the police. They constantly counsel their children about how to act if stopped by a white cop. Many want to send their kids to predominantly Black colleges in Atlanta to escape the violence. White cops are definitely very cautious about Black youth. The widespread use of video cameras has made officers potential targets of scrutiny, especially after high profile shootings of unarmed black teenagers were caught on camera. My Chicago is a war zone in certain areas, but to me it still feels like a thriving metropolis of great restaurants, theatre, and beautiful parks. The Lakefront is as spectacular as ever. Joggers and bikers are everywhere. Tennis and volleyball courts are jammed in the summer. Manufacturing has moved out of the city for the most part because real estate has become too valuable to be used to bang out widgets. But the area around Ohare Airport still houses many hundreds of factories. Skills are available in Chicago if you are willing to pay for them. Politics in Chicago and Illinois are maddening. Rahm Emanuel wanted to be Mayor of Chicago for some ungodly reason and he is paying the price for his decision. His popularity is extremely low. The city is virtually broke thanks largely to his predecessor, Rich Daley, who never had the guts to turn down organized Labor’s demands. The teachers loathe Rahm. They figure he stole the last election by withholding the videotape of the killing of Laquan McDonald by a cop from public view until after he won the runoff. The school system cannot afford its pensions and current staffing and seems ready to accept a strike. Emmanuel is borrowing from Peter to pay Paul but a showdown is coming with the teachers. Meanwhile, Illinois state government is in a permanent stalemate that makes Washington look like a yoga class. Politically, racially, financially, Chicago is a total mess, but as we head into spring the place is bursting with a positive energy for the Cubs and the Blackhawks. Chicago loves its teams and I’ve never seen so much optimism about my Cubbies going into a season. Everybody loves them. Of course, this scares me to death, but that’s another column. I travel to the Bay Area frequently to see my daughter and family. It is a happier place than Chicago. People are not killing each other nearly as often. Racial fear is not on everybody’s mind. The weather is 10 times better out there. They have Steph Curry making threes, which is certainly a natural resource. But Chicago still has a lot going for it, even if the city totters near bankruptcy. It has a fantastic energy that the Bay Area does not exude. It has way better pizza. It’s in the middle of things, and the country. You can still live in a nice place that is affordable. My wife and I often talk about moving to California. The weather in the winter would sure be nice. But Chicago is such a hairy beast of a place, it will probably hold us in its powerful jaws forever. Question: Do you want to live where you’re at, forever? We have no KKK in Chicago, no lynchings, that’s just a damn lie. i was just in town last Saturday driving in from Grand Rapids to attend a meeting regards a hotel condo room i own down on Delaware Street (Raffaello). It is funny because now the original re-developer is wanting to buy the pace back – at a deep discount – talk about Chicago politics! lots of people in Grand Rapids fancy GR a “small Chicago” . . . and maybe in a way it “might” be so with its past several years resurgence. But i have been visiting Chicago area since i was a little tike – what with my Aunt living in Lincoln Park area and Old Granny out in Lombard . . . later i would stop at “Famous Liquors” when out in Lombard. but i digress . . . every city has its poor and dangerous areas, even GR and Kalamzoo, where i went to College. To fix that – we need to end iliigitimate children and lack of an education, or skill . . . without stopping these – the poor shall remain poor – or “the People of the Abyss” – by Jack London. in closing – no – i do not want to live where i am forever – but then, every beginning has an end and where our heart is – there is our home. i think that is in the Bible somewhere – sorry to ramble Lloyd – but i always have and always will love Chicago — even from 200 miles away. We grew up in Chicago, went to schools there and now living in LA area; we’re going to move back to Chicago. Maybe not 100%, but for sure a good part of the year in retirement in a few years. Perhaps by that time, new leadership can right the ship. Illinois-Chicagolands’s overreaching policies, and budget problems will be it’s eventual downfall. Research the Red Light Camera ticket scheme, it should make you sick. On a side note, for years the only people on the streets with guns were criminals. Finally Illinoisans just got the right to conceal carry again, and people seriously wonder how it became such a war zone. Given the poor socioeconomic state of things, coupled with strangle-holding good citizen’s rights to bear arms, it’s was the perfect recipe for what has transpired. They created a vulnerable victim base because criminals don’t follow gun laws, only people who are trying to stay out of trouble do. I only hope more people acquire their CCWP and help weed out the troublemakers that are killing others. But…knowing Illinois the justice system will still try and do their best to lock up even people who were just defending their life. I wonder if those wanting to leave Illinois and the remaining top ten are Republicans or dems? Seven of the top ten have voted dem every year since 1992 according to George Will in 2013. All Democrats. They control both Cook county and East St. Louis. Many blue collar and coal mining folks no doubt were good folks but voted for Democrats because daddy and grandpa did. Am I biased? Oh you bet. Am I a Conservative and wants to fix this state? Oh you bet. But this state is too far gone. It needs to go bankrupt and be closed out and allow good people take over. Until then, it’s never going to change. Republican’s are not necessarily the answer. Some of them are powerful money grubbing selfish turds as well. It’s time we have a spiritual revival in this state and our nation or forever we will repent that our nation went to hell while we were piloting the ship. My mother grew up in the ’30’s and ’40’s in the South Austin neighborhood west of the Loop. In those days, the neighborhood was distinctly Irish and even as a kid in the ’60’s I remember the Callahan’s who lived next door and the Sullivan’s across the street from my grandparents. Despite its proximaty to Oak Park which has stayed fairly upscale to this day, my mother’s neighborhood, although not as downtrodden as Englewood, is in pretty rough shape today. The two-flat that she grew up in burned to the ground in the late ’70’s and the lot is still vacant today. I moved away from Lombard, IL when I was 12 years old and haven’t lived in the Chicago area since, but I still tell anyone who is interested that I am from Chi”caw”go. I go out of my way to pronouce the name properly. Most people from other places don’t. As a business owner, an Illinoisan, a tax payer, a father of two U of I college students (one graduates in May the other in mechanical engineering in two years) and a man who has watched Chicago control our state I am always willing to dive into a discussion about my state and the one city that controls it. When I travel the nation on motorcycles I walk into businesses and they ask “where ya all from”? I say, Illinois BUT NOT CHICAGO! They need to know that because I don’t want to be thrown out before I get to buy my lunch. We all laugh and they complain about our president and other crap and we all agree that we have caused a lot of strife us folks from Illinois by allowing the BS we have allowed for decades. I’m just one guy, and one vote and I’m not from Chicawgo. I do think that city could have been amazing but it was corrupted a very long time ago and has not ceased to be corrupted. The end days of Chicago will be written in the newsprint but it may take more decades before that final day if it comes. Will it be like Detroit? Well, most of us in this state think it already is. Many in leadership should be in prison but that’s another story and you did elude to it Lloyd. Why ruin a state that is in the heart of our nation? Yet, they have done so. It was a slow continual creep. We in downstate are treated like we are peasants to hear Chi-town folks talk. When my daughter flew out to New York she said, Dad you can’t believe how much nicer NY is than Chicago. Chicago is a dump compared to NY. But she wasn’t talking about clean as NY she said was dirty. She was talking about size and how pretty New York is. Now, after saying all of this, let me say that I like Chicago when I don’t think about the control the bad leadership has had all of these decades. I like Chicago for so many reasons. I just won’t go there by design because of the corruption they have become known for and I won’t spend my money in that City. I’ll avoid it. Don’t stay away from Chicago based upon what I or anyone else says. Go see for yourself. Stay out of the war zone that Lloyd has shown in photos and described because that is perhaps a very dangerous place that even the well armed police won’t go. But there are plenty of nice things to do and see and enjoy up there. Oh, tell Chicago to keep their political action committee money in the city, we don’t want those powerful businessmen down in our districts influencing our politics as they did the primary. Control freaks. You described exactly how I feel. I moved to Indiana to get out of the state technically, a good step in the right direction, but still work in Illinois because I like the people I work with. There are a lot of good people in this state and in the Chicagoland area just trying to make an honest and productive living, and then there are the politicians doing the exact opposite or making it harder every year. I avoid the city at all costs. After paying $50 to park at the Chicago theater one time, the horrid roads, bad traffic, and constant feeling of being “watched” I don’t care for it personally. Ryan, most of the young people I know gravitate to the big cities to work, meet people, and advance. If you have skills and confidence Chicago is very attractive. Despite the roads and the cops and the violence Chicago is a magnet. This holds true if you are viable in the workforce, not struggling for a McDonald’s job while trying to support children. Big cities are expensive to live in. The suburbs, at least where I live, are cheap. And young people do not want to live there because they are boring. Bankrupt, Corrupt, Progressive Hell Hole. But still one of the most fun Cities in the world. Thought I would live where I’m at (Wisconsin) forever but after the cold winter a couple years back the wife and I talked about becoming snowbirds. Never thought I would even consider that. Must be getting old. Hey Lloyd email me sometime, would like to talk. I’m a native Chicagoan. I’ve lived elsewhere due to school and the military. I didn’t appreciate Chicago and its multiples and diversity of everything until I moved back. I’ve tasted water in 45 out of the 50 states. Chicago has the best drinking water, an important plus that must be mentioned. My grandfather settled in Lincoln Park / Lakeview when he came here as a child from Sweden with no parents and by sheer hard work he made a good life for himself and raised a family there. My father being raised here lived most of his life on the north side but moved to the suburbs after getting married. I spent a fair amount of time with my grandfather as I was growing up. I myself have recently moved into Lincoln Park from the suburbs because I got a good deal on a flat from some friends. It’s familiar to me, its my old stomping grounds, I know it well. My grandfathers / fathers old houses (moved 3 times) are 2 blocks in either direction from me and they finally settled around Ravenswood & Irving Park. I’m the 3rd generation here and my daughter is now the 4th generation as she lives with us here for now. But are we staying? The short answer is no. My parents left for Arizona years ago. While my daughter has job offers in Chicago coming out of college in May, but she has indicated she will not stay here for any great length of time and will leave the state of IL after getting her footing. IL and the City are too far in the hole to ever recover. The constant wars in Springfield not to fix anything is beyond appalling. If anyone thinks this house of cards won’t collapse think again. I will be looking to go to AZ in due time. IL is unfriendly to businesses (my wife dissolved her LLC here recently and moved her business to another state) and consumers alike and am not surprised by the exit rate at all for both. I love my neighborhood but simply cannot stay here for the economics of it plus the city overall is getting more dangerous by the day. I have a lifetime of history here, It will be missed. Excellent, very well written article, lloyd. My connection with Chicago began when, as a child in the 1940s, I occasionally accompanied my dad on business trips to Chicago. As a kid I was very conscious of the size of cities, as we traveled from the small town in Wisconsin where I lived through Milwaukee (big) to Chicago (bigger/BIG). That association went beyond comparative physical size, and included the noise and excitement, diversity, beauty and squalor, sense of power and grandeur, opportunity and danger that, as a child, I associated with Chicago. As a resident in Chicago and a north side suburb from the mid 1960s-1980 I felt that Chicago was a strong, vibrant and prosperous city that was renewing, with even better days ahead. I suppose it’s arguable when the decline began, and it’s sad. However, it’s dangerous to extrapolate trends too far into the future. The city may eventually have to go through bankruptcy before reemerging as a new version of the great city it once was. I live in Chicago (not the suburbs) and I am raising my 3 children in the city (from 0-9yo). They experience homelessness, brokenness, lost people, hopeful people, vast diversity and the incredible energy of a bustling city. When you experience those influences on a daily basis, it shapes you in a positive way that non-city living cannot. I don’t try to pretend that the world is not broken and that our city is not broken, but my intent is to teach them that we can make a difference in the lives of individuals in our city.